We have been dedicated in providing high-end fine art printing and scanning services using the latest techniques since 1999. Originally set up in May 1999 by Director and artist Michael Setek, to provide specialist Fine Art reprographics and printing services for artists, publishers and galleries. As a graduate of Chelsea College of Arts, Michael saw the opportunity to work with other artists in the developing area of digital fine art print media and reprographics, now commonly used many in their art practice. A great deal of research, time and investment in fine art scanning and printing has enabled Art4site to utilise the most up-to-date techniques. We are now highly experienced in this specialist field having worked with a vast variety of visual artwork and many projects of varying complexity. Our personal input into the process makes a real difference to the finished giclee prints and cards where the quality stands out. Such a focused knowledge has attracted clients who want to get the best out of their artwork with the knowledge that our speciality is in working exclusively with painting, drawings, illustrations and art that incorporates the use of digital media. Our clients are our peers. We recognise that artists, art publishers and galleries would benefit from a service that is provided by artists. Currently all production staff are trained practitioners with a degree in fine art illustration or fine art painting. We cater for a wide audience. Our clients include both professional and amateur artists, as well as leading art publishers and galleries. Many of our customers are based in London and the south-east of England, but our services are sought after from all parts of the UK, across Europe and the rest of the world. With shipments sent daily on a national and international basis, we cater for a local as well as international audience. At the same time, we offer an extremely personable service and can offer on-site appointments to bring and discuss your artwork, proofing and printing requirements. We have extensive knowledge of how to correctly publish limited and open edition fine art prints. This experience can be helpful when a client needs further advice and support. No matter how large or small your requirements, we have the capacity to provide a highly efficient service. We can deliver your giclee and canvas prints and cards ready for exhibitions and general sale, in a timely manner. We have a longstanding knowledge of fine art printing and offer a wealth of experience to back up our daily production. We have the ability and expertise to consult with artists and galleries in a variety of bespoke exhibition quality printing. We are recognised and assessed by number of professional organisations relating to quality assurances for our printing. Such accolades are a great testament to our commitment to following the highest standards in print. 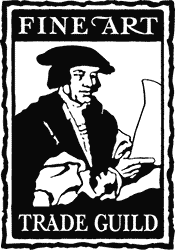 We achieve and maintain excellence in art reproduction and digital art. 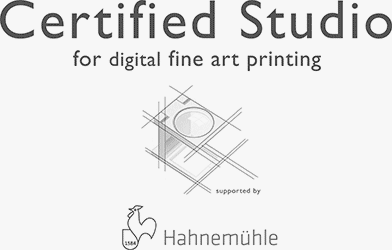 Fully accredited since 2013, our studio must has an advanced education level regarding longevity of prints, with full competence in colour managed fine art inkjet printing workflow. Find out more about the Certified Studio programme. Award winning fine art printing. 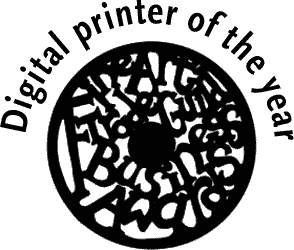 We have been previously awarded the title ‘Digital printer of the year’ by the Fine Art Trade Guild. Also we have been finalists for the award for three consecutive years. Fine Art printer of the year - highly commended. 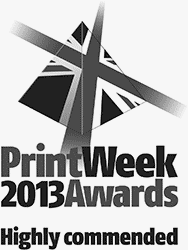 We have also been given the title ‘Highly commended’ in the Print Week Awards fine art printer of the year category. Also previous finalists for two consecutive years. Fine Art Trade Guild recommended printer. Now a member for fifteen years, we can verify the integrity of our printing and maintain Guild Print Standards in relation to all quality requirements. Visit the Fine Art Trade Guild website for more information. All our greetings card printing and most of our packaging are FSC® certified. This means you can be confident that buying from us won’t mean harming the world’s forests. For more about our environment credentials, visit the Forest Stewardship Council®. All our greetings card printing and most of our packaging are FSC ® certified. This means you can be confident that buying from us won’t mean harming the world’s forests. 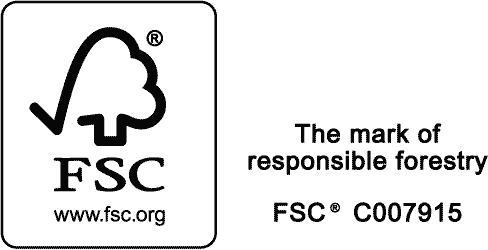 For more about our environment credentials, visit the Forest Stewardship Council ®. Our customers include professional and amateur artists, art publishers and leading galleries. We receive many recommendations from our customers which is how we gain a large proportion of our work. Art4site provides a first class service and has consistently delivered fantastic exhibition prints for us. We would recommend the service to anyone whose business relies on quality and excellent customer service. After several years of scanning and printing my fine pen & ink work with Art4site I have to give some credit to them, as part of my success is due to their meticulous scanning of large originals and high quality printing which has been praised both in England and abroad. Art4site’s prints are very good. They have a great skill in reproducing the right colour and have a wonderful choice of papers (also canvas). I have also had greetings cards printed by them, and all the buyers of my cards have commented on the quality. Art4site has been doing my prints for me for several years and I am completely delighted with the results, which, because of the quality of the scans and the colour matching, as well as the high quality papers he prints on, are very hard to tell apart from my original watercolours. They are conscientious, fast and very reliable, and for this high quality product his pricing is very competitive. I cannot recommend Art4site highly enough: as a relatively new business Art4site patient help took us through our first, hesitating steps of setting up; encouraged our further progressions along the way, and now has become a very welcome stalwart in our plans for growth and developement. For a personal, knowledgeable service, Art4site couldn’t be bettered. The people Art4site are great to work with, knowledgeable, caring, with a great eye for colour and detail. I have always found their giclée prints of a fantastic quality, and I would highly recommend them to everyone. We are concerned to ensure that our business activity has the least possible impact on the environment. Over the years, we have undertaken a wide variety of measures to our procedures and print production to help make a difference. Currently, all our packaging is plastic free and has been especially sourced to include a high percentage of recycled waste. The majority of our wrapping is also now fully FSC certified and 100% recyclable. Our main courier partner is also concerned to make every parcel we deliver carbon neutral, by striving to reduce CO2 emissions and by offsetting. Switch off heating, equipment and lights when not in use. Reduce the amount of paper waste by printing in the most efficient manner. Recycle all our paper waste. Work with suppliers that are environmentally conscious.